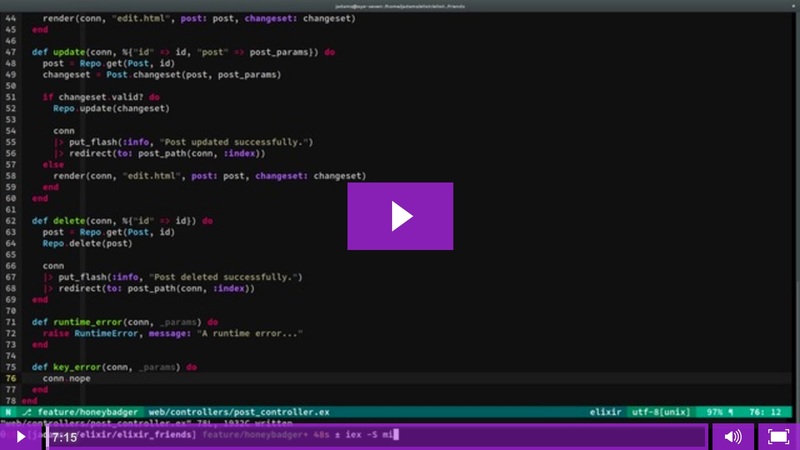 Watch our screencast by Josh Adams of ElixirSips! If environment_name is not set we will fall back to the value of Mix.env(). Mix.env() uses the atomized value of the MIX_ENV environment variable and defaults to :dev when the environment variable is not set. This should be good for most setups. If you want to have an environment_name which is different than the Mix.env(), you should set environment_name in your config.exs files for each environment. This ensures that we can give you accurate environment information even during compile time. Explicitly setting the environment_name config takes higher precedence over the Mix.env() value. The Honeybadger package can be used as a Plug alongside your Phoenix applications, as a logger backend, or as a standalone client for sprinkling in exception notifications where they are needed. The Honeybadger Plug adds a Plug.ErrorHandler to your pipeline. Simply use the Honeybadger.Plug module inside of a Plug or Phoenix.Router and any crashes will be automatically reported to Honeybadger. It's best to use Honeybadger.Plug after the Router plugs so that exceptions due to non-matching routes are not reported to Honeybadger. Just set the use_logger option to true in your application's config.exs and you're good to go! Any SASL compliant processes that crash will send an error report to the Honeybadger.Logger. After the error reaches the logger we take care of notifying Honeybadger for you! You can manually report rescued exceptions with the Honeybadger.notify function. origin URL for the Honeybadger API "https://api.honeybadger.io"
Honeybadger.notify: Send an exception to Honeybadger. Use the Honeybadger.notify/2 function to send exception information to the collector API. The first parameter is the exception and the second parameter is the context/metadata. There is also a Honeybadger.notify/1 which doesn't require the second parameter. Honeybadger.context/1 is provided for adding extra data to the notification that gets sent to Honeybadger. You can make use of this in places such as a Plug in your Phoenix Router or Controller to ensure useful debugging data is sent along. Honeybadger.context/1 stores the context data in the process dictionary, so it will be sent with errors/notifications on the same process. The following Honeybadger.notify/1 call will not see the context data set in the previous line. # as this runs in a different elixir/erlang process. If you'd like to see the module in action before you integrate it with your apps, check out our sample Phoenix application.